We receive a maximum of 6 persons at a time to be able to help them individually. The lathes, a complete set of instruments and all the necessary wood are part of the professional material that we make available to each guest who will be going back home with his own production. A small leaflet, helping to memorise the woodturning technique, will be given to each participant. Courses are from 8 :30 am to 1 :00 pm and from 2 :00 pm to 6 :00 pm . creating useful and decorative objects. 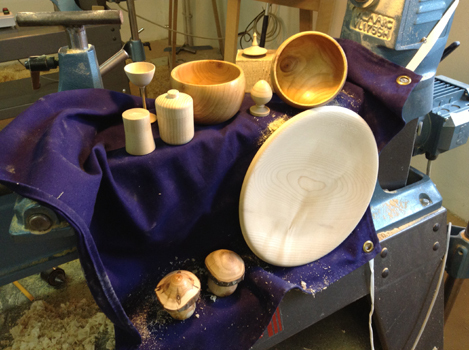 You can deepen your knowledge in green wood turning, very thin turning, or large diameter turning. We would like you to mention your wishes while you are booking your workshop. We organize, upon request, any workshop for a group of 5 persons who themselves decide about their program.